A history of the infamous Mutiny at Sailboat Bay hotel and nightclub, the epicenter of Miami’s cocaine boom years. Miami’s reputation in the 1980s as the stronghold of the cocaine trade was popularized by the film Scarface and TV series Miami Vice, but the real story may eclipse even these portrayals. Through turf wars, assassinations, and arrests, the only certainty in Miami’s drug trade was the hangout for the industry’s key players to show off and flash their dirty money. In his investigation into the Mutiny, Farzad, who hosts Full Disclosure on NPR, captures the excess, decadence, and debauchery of the Mutiny in its heyday. This was where kingpins did business in the hotel suites, crooked lawyers and financiers held office hours at the club, and the entire staff were all in on it. With interviews from many of the people who lived it firsthand, the author showcases a cast of characters composed mostly of Cuban exiles and Colombian immigrants, including Ricardo “Monkey” Morales, Rodolfo “Rudy Redbeard” Rodriguez Gallo, and the legendary Willie Falcon and Sal Magluta. The story of the Mutiny and Miami’s cocaine gold rush is primarily a tale of the American dream, its corruption, and the lengths an immigrant community will go to fulfill a capitalist fantasy of affluence. But for all the glitz and glamour of the Mutiny and the lifestyle of cocaine elite, there was a brutal and nasty flip side. Suspicion, paranoia, and murder were common practice in the trade, a fact epitomized by the symbolic Dadeland Massacre in 1979, which ushered in an unprecedented wave of violence that earned the city the title of murder capital of America. The luster of cocaine and the Mutiny eventually faded, as crack became the preferred form of the drug and federal investigators prosecuted many of the Mutiny’s habitués. But the legend lives on in Farzad’s narrative retelling of the Mutiny, which provides a crucial piece to Miami’s history as the era’s cocaine epicenter. A gripping account of how the Mutiny’s role in Miami’s cocaine business changed not only the city, but America. 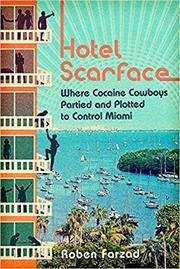 Roben Farzad’s Hotel Scarface: Where Cocaine Cowboys Partied and Plotted to Control Miami is a rip-roaring ride through South Florida’s heyday of Kafkaesque excess: the 1980s.